In order to get the Arduino Eclipse Plugin to work with the Teensy 2.x and Teensy 3.x boards from PJRC and to enjoy all the goodies in form of optimized libraries that come with Teensyduino, a Teensy Extension file was needed. The reason for this is that Teesnyduino does not yet support Arduino 1.5.x but the Arduino Eclipse Plugin and the new Arduino Eclipse IDE requires Arduino 1.5.2 or 1.5.5 (NOT 1.5.4 !!!). So the previous Teensy extension file simply included files from Teensyduino installed into the Arduino 1.0.5 IDE and copied and slightly restructured into the Arduino 1.5.2 IDE. 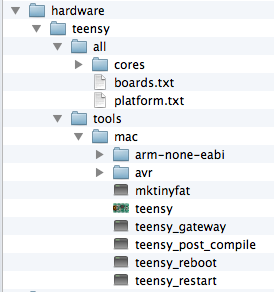 It also required a new boards.txt file and a platform.txt file that informed Eclipse where certain files were located. However, the development cycles for the Plugin and Teensyduino follow different cycles and it is hard to maintain and keep up-to-date a Teensy Extension file that reflects the latest status in from release candidates or bug fixes that are not yet released but can be found in the Teensy GitHub repository. Thus, with permission of Jantje, the author of the Arduino Eclipse Plugin and Arduino Eclipse IDE, the following instructions describe how a user can create the Teensy Extension file by themselves. This will enable users to always stay on top of the latest developments in the Teensy world. Install Arduino 1.0.5 and the latest version Teensyduino which is RC 18.2 at the time of this writing. Note: for Windows users the folder name “mac” needs to be replaced with “windows” and for Linux users the folder name needs to be “linux”. Download and install Arduino 1.0.5 and the latest version Teensyduino which is RC 18.2 at the time of this writing. 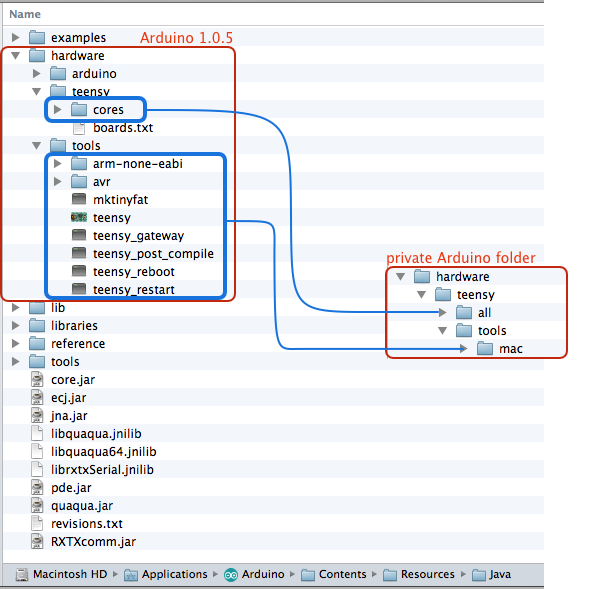 Copy the “cores” folder and the contents of the “tools” folder as shown in the mage below to the folders into the locations into the”hardware” folder you created earlier in you private Arduino folder. Done. You can now continue with step 9 of the installation instructions for Version 2.2 of the plugin. I followed this howto but the links in the text (https://github.com/Sloeber/arduino-eclipse-plugin/blob/master/teensy/configuration/boards.txt and https://github.com/Sloeber/arduino-eclipse-plugin/blob/master/teensy/configuration/platform.txt) are no longer valid. Is there another site where I can download?